A couple of days back, Samsung surprised the whole world by churning out the successor of Tab 2 that was destined to be released at IFA 2013. Anyway, we have the review device with us and we were lucky enough to run a few benchmarks on it to see how it compare benchmark wise to the Galaxy Tab 2. 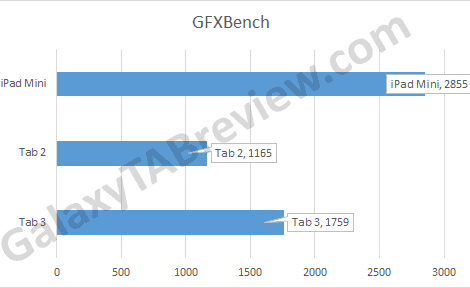 As you can see, the Tab 3 7 inch scored much higher than the Tab 2, which scored mere 1165 points in GFXBench 2.5 Egypt HD C24Z16 test. However, it is evident that even the new Galaxy Tab 3 is no match for the Apple’s iPad Mini released last year that carried the processor of iPad 2, the Apple A5. The iPad Mini scored 2855 in the same benchmark test. Size wise, the Galaxy Tab 3 7 inch is thinner, less wider and less taller despite packing same size screen. Even the battery capacity (4000 mAh) has not undergone any change. So, yes the Tab 3 is more pocketable and mobile. Battery is non removable in both. 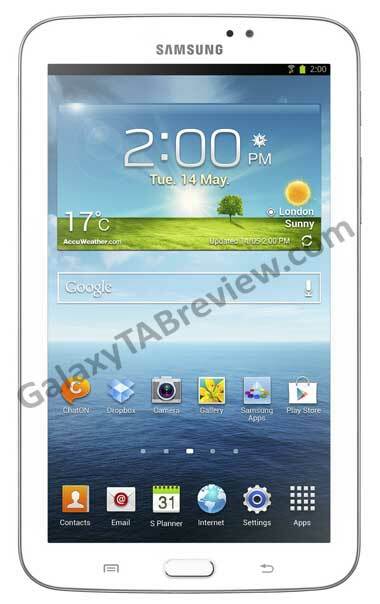 Samsung Galaxy Tab 3 7.0 weighs less than Tab 2. The Galaxy Tab 2 7.0 weighs 345 grams whereas the Tab 3 weighs just 306 grams (3G). The Wi-Fi version weighs 4 grams less at 302 grams. The only not to like about it is the fact that the display is still at 1024 x 600 pixel resolution. The tablet runs 200 MHz faster, at 1.2 GHz. There is no bump in camera MP size or features better front camera. The addition of home button on the front may not be liked by all as we have been made accustomed to the soft keys.